Bring the comfort of the indoors to your outdoor garden and enjoy relaxing underneath a shady tree listening to the birds in their natural surroundings. 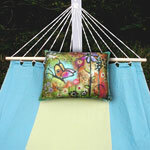 Designs in this collection include animals, butterflies, flowers, abstract patterns and nature scenes. These unique chair swing designs are unique and sophisticated and blend modern designs with bohemian furniture. Solidly supported with a 33-inch wooden spreader bar created from strong Chilean pine, these chairs are perfectly fitted to hang from a tree branch, swing set, deck, porch or patio. Each swing can support up to 250 pounds. The ultra-comfortable polyester cushions are machine washable and mildew resistant and resist fading. Their extremely durable weather-resistant properties make these chairs attractive items to purchase for the outdoors. Celebrate a special occasion with these chairs and help your guests remain comfortable throughout the festivities.